A few years ago, I found myself staring at luscious cauliflowers in the produce section with wonder and it was only then that I realized that I cooked only with frozen cauliflower. I vowed to change that immediately and placed a gorgeous cauliflower head in my cart. My heart sang all the way home because I knew I would be biting into the fresh taste of that crunchy crucifer that I had been missing all this time. I set it up on my cutting board with great gusto and started removing all the outer leaves carefully. My father-in-law had told once me that those leaves were edible and quite nutritious but right now I was more interested in the "white curd" of the head. From the corner of my eye, I saw a very plump and very green young leaf move slightly. I turned the cauliflower to address that leaf and the other leaves that were still attached to the head in that area. I cut through the leaf only to see it start to ooze and wiggle like it was possessed. That green leaf was a humongous green worm, fattened by all the minerals in the vegetable. My husband says I screamed the house down. I don't remember. I just remember curling up on the floor and wishing that the cauliflower and its resident would just disappear. Needless to say, I had forgotten why I bought only frozen cauliflower. You see if there are a hundred cauliflowers in the produce bin, I pick the only one with worms in it. Such is my luck. I went back to buying frozen cauliflower until very recently. I still don't care for worms in my produce but I have become more used to different types of worms after attempting to make a vegetable patch in my backyard this past summer. Medha is a fan of worms; she indulges in baby talk with earthworms that she holds her in her palm. She has dangled them in front of my face several times to see if my reaction changes over time; a scientific experiment, she says, to see if the data will change over a period of time. My screams are no longer as shrill as they used to be but my threats have become worse. And How to Eat Fried Worms also helped quite a bit. I sat through it without throwing up. 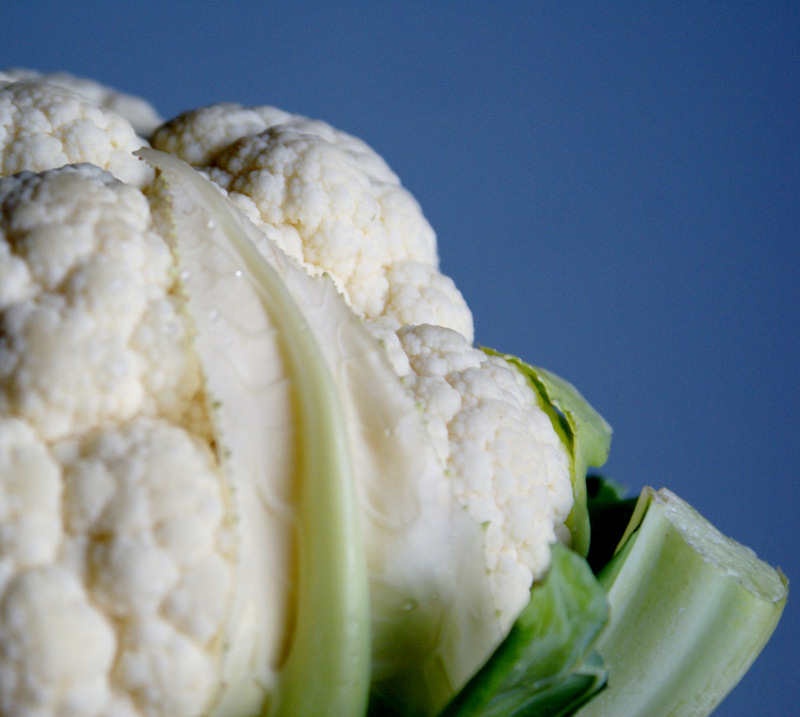 Cauliflower still remains one of our favorite vegetables and I am glad it does. If properly washed and cleansed of all trails that worms might have left behind, I love to eat it raw. I don't like it cooked or boiled into a soggy mess but I do love it when it's cooked well. Anita calls it al dente; I call it just right or tender but crisp. There are so many ways in which to cook cauliflower that when my sister wouldn't stop raving about her friend Sushma's mouth-watering recipe, I just rolled my eyes. But she's not one to give up and made it for me when she visited. And I was hooked. It didn't have ginger like most aloo gobi ki subzis do, it had crushed garlic! Cut the cauliflower into large florets, about 2 inches in size. Peel and dice the potatoes into slim chunks, about 1/4 inch by 1 inch. We will be adding the potatoes along with the cauliflower and we want them to cook without having to overcook the cauliflower. Add crushed garlic. Before it browns, add cumin seeds, red chilli powder and turmeric powder. Take the saucepan off the stove and add cumin powder and coriander powder. Add cauliflower florets, potatoes and salt. Toss or stir well. Cover, return to stove and cook on a high flame until the cauliflower starts browning and the potatoes are cooked. Sprinkle with a little water to help the potatoes if they are taking too long to cook. Also dilute the tomato paste in 1/4 cup water, mixing it well into a thick paste. When the cauliflower is tender yet crisp and the potatoes have cooked, add the thick tomato paste and sprinkle the garam masala. Mix well in an almost folding-like action, briskly moving the cauliflower and potatoes from the bottom up. Garnish with cilantro and serve hot with parothas or rotis and yogurt. I like to add some chopped green chillies towards the end for an added kick. Any fragrant garam masala will do. If you would like to make your own, try this garam masala. Or you could use a store-bought garam masala. It's always better to make your own because you are sure you are using the choicest ingredients but not everyone has the time or the energy, in which case I think it's perfectly alright to use store-bought garam masala. And now it's time to whoop a bit, do some virtual cartwheels and while I am at it, I might as well fly down a ski slope, too! I'm celebrating 30 consecutive days of posting, as part of NaBloPoMo. It was a lot of work and challenging at times but I did it! I did it! I found some great local blogs, made some wonderful new friends and connected with several other bloggers. I hope to have a list of these blogs up soon! Yay me!! And yay to all my NaBloPoMo friends and writers who wrote every day through the month of November! And yay to those to who joined in late and wrote with as much fervor! But, really, this is looking like one more gobi-aloo to add to the already great arsenal! Looks great! Yes, congratulations are in order. Well done, dear Manisha! Take a break, sure...but try to keep it shortish, so that we, your ardent fans and readers, are not deprived for too long. Keep the recipes flowing too...like this gem from Sushma here. Yesterday I bought some coarse corn flour (cornmeal) so that I can try those wonderful savoury muffins (without pepitas though) for breakfast tomorrow. And you can be sure I will be making this variation of aloo-gobi within the week! bhhoooo...I won't talk to you ever! Okie, I came back to take my pillow and bed...let me also tell you this before leaving...aloo gobi looks so picture prefect..and no good on completing the nobo#$#%%#$.whatever! huh! Wow simply rocks!! cooking with gobi is kinda challnnege for me,, yours looks delish!! Looks delicious.Yeah i remember once my MIL gave a brocoli from the garden and she told me wash it with vinegar so that if there is worms they will fall out. But i was lazy and i just washed them with water and then i was boiling the brocoli ( was plannig to make brocoli with cheese sauce) and then i suddenly saw something floating above the water , it was a huhe worm , dead by now by the boiling. So you can imagine that day there was no brocoli dish with cheese as i threw the whole mot away. And when my MIL asked me how did the homegrownbrocoli tasted i told her DELICIOUS i didn't had the heart to say i threw it away as there was this hyge worm floating above . Yaaaaaaay...congrats Manisha. It really is a huge effort to post good stuff everyday and that too with a life existing outside blogs. What a beautiful pic of cauliflower. And don't feel bad, I squealed the other day, when an itsy-bitsy-teeny-weeny wormy-like creature came crawling out of my bunch of arugula from the farmers' market. Anita, hey come on! This time you beat me to the aloo gobi by a whole day! The garam masala I have - my cousin's secret recipe - has been better in the past but it is still wonderfully fragrant. I haven't come across another garam masala like this one. My aunt gave my sis the recipe when we visited her in May saying hers is the original recipe. But the masala she gave us with the recipe is not like anything my cousin makes. I have so much of it that I have no reason to attempt to make it - just yet anyway! But think about it in the larger context. I would rather cook this with a store-bought garam masala than not cook it because I didn't have the spices or the inclination to make my own. This is such a simple dish to make and the spicier you make it, the better it is! And, it's healthy, too! Cauliflower is 90% water, lots of vitamins and potassium. I have more recipes from Sushma. She is an amazing cook and is originally from UP. Let me know what you think of this recipe! Oye! Srivalli, bori bistar baandh ke kahan chali?! You will come back you know! And make the cauliflower - it's vegetarian without the worms! Sunita, thanks! And yes, I am celebrating tonight with the ladies in our 'hood. We're getting a local bead shop to open up after hours and we will have wine and appetizers while pretending to bead! Kalva, this one works with frozen gobi also. Don't thaw it though. Happy Cook, that's too bad! But I know how you must have felt! I didn't know about washing with vinegar. Hmm! Must try it some time! Sagari, it is one of our faves! The chief advocate returns with a suggestion for January! Sandeepa, how about you do it 3 times a week in Jan, then I'll take the tag from you and do it 2 times a week in Feb, then I'll tag someone and they do it 3 times a week in March and so on...And you can tag at the most 3 people but you have to get their OK before tagging them. Otherwise the walls of DH will reverberate yet again! The crushed garlic gives it a wonderful aroma and is very nice change from ginger. I love julienned ginger in my aloo gobi. Priya, I dug so many things out of my archives. It helps to be maniac when it comes to taking pictures! And, don't worry about the cauliflower with the worm in it. I always buy it so the one you buy won't have any! Susan, yeow! But I am so envious of you! You still have a farmers market going. Our last one was towards the beginning of October, I think. We have the one and only winter farmers market next weekend, which I absolutely have to try to make it to. They have all kinds of mushrooms and some root veggies. Worms in your vegetables just means they are healthy and edible. Think of the pesticides in your food if the worm had died, a growing concern in American culture! ©Hotbutton Press, how true! Thank you for making me feel much better! I still need to get over the nausea that engulfs me when I see those things! Pel, dhanyavaad! You should read some of the blogs out there - so many excellent writers! I am going to close shop for a while but it looks like I am just as busy replying to comments! c'mon now. you can stop blogging for a week. it's illegal. didn't you read the nablompo fine print? you're supposed to post every other day for a month now. i love cauliflower recipes wihout onion. this one looks great. the only way i really cook cauliflower is in pav bhaji. Until I had cauliflower desi-style, I could never eat it because Westerners mess it up (in my opinion, anyway.) However, now, it is one of my favorite veggies. I also roast it in the oven with kosher salt and garlic - I cannot keep my toddler son's dirty paws off of it. 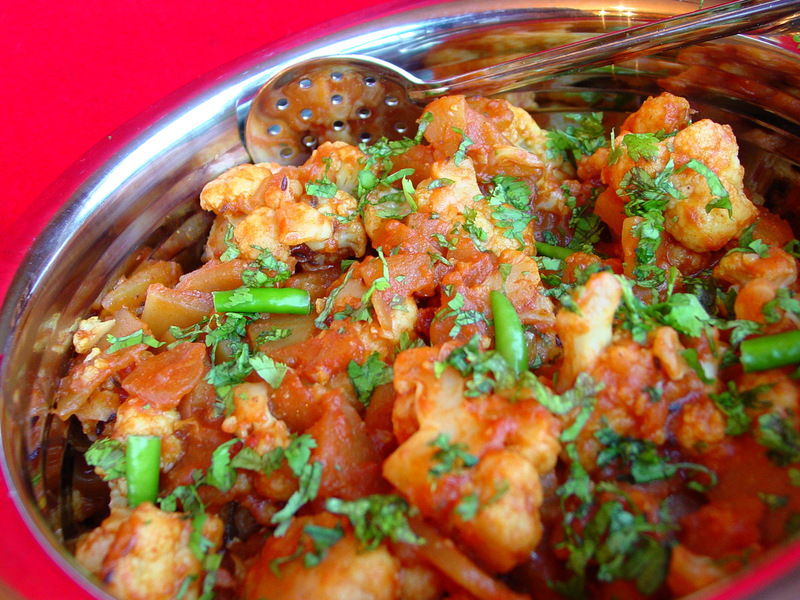 Frozen cauliflower is ideal for pav bhaji. Try Ashwini's gobi ka kheema. Most of the bhajis I make are usually without onion - a quick phodni, some ginger or garlic maybe, some masala maybe and that's it. Kelli, roasted cauliflower is very delicious. I have a recipe and pictures for that, too! I just need to find where I wrote down the proportions! You can't eat cauliflower when you are nursing? Siri, thanks! Good for you, too! Maybe you can do all 30 days next year and all 31 days in October before that? Clap clap clap... You did a wonderful job. And just yesterday I was wondering why I don't see worms in cauliflowers bought here, while there were always few in the ones brought in India :p.
I have started liking cauliflower recently (like 2-3 yrs. ago) and the reason for my dislike was the worms (shudder)! However, I am big-time into cauli-flower and have begun to master the art of picking the ones without worms. Great pics, btw. Oh, I know it! I was just saying the other day how much they had changed my life! i think, this recipe i can do- i just have to get me some garam masala (i am not making that, for sure.) i love cauliflower and i probably would have the same reaction that you had with the creepy crawly. even those roly-polies in the dirt give me the creepies. Congratulation on finishing Nablo. Thanks for being my friend. Let's go for those noodles soon! Mmm ... cauliflower and aloo seem like the desi fall vegetables :) *so* good! Hey Manisha, congratulations! Now go, get that well deserved break :). Thanks a lot for bringing such wonderful reads, everyday!! Aloo gobhi is looking yummy! I have tried it with ginger and garlic, but never with garlic alone. Time to try some :). I love cauliflower....and like you, I love to eat it fresh instead of frozen (especially with the garlic and aldente, yum). But, but..a worm?? I think I would need time to recover. Congrats Manisha :). Take a break and come back soon, I need something good to read daily morning. It was such a pleasure to find something very interesting here daily. If not daily, atleast pick some days in the week, and regularly post on those days so that we know for sure to check out new stuff :). My biggest obstacle to cooking is getting all the ingredients. I am always convinced that good cooks have all this stuff on hand and people like me must spend hundreds of dollars on the list. The way I make cauilflower is less ingredients. ;-) I mash it up like mashed potatoes with butter and salt. So yummy. If I ever win the lottery and have ample time and money I will make sure to visit you for the recipes! Suganya, I buy all the ones with worms here which is why you don't see any! My cook always cleaned cauliflower for me because I could not bring myself to! Manasi, you guys are all hard taskmasters! Try this recipe - it's simple. There is an art to picking cauliflowers without worms? Do tell! Pel, yeah and sucked up all my free time, too! Marysmom, I can definitely give you some garam masala. Make it for lunch when Jack is not home! Kaykat, cauliflower is a great fall veggie! You should do NaBloPoMo next year. Mark your calendar! Musy, me either. This was the first one with only garlic. It does have to be spicy to be good but I tone it down regardless. Sandy C, box of pop-tarts?! No! In the individually wrapped pop-tart or on the outside? I once brought home a packet of Lipton dehydrated soups that had several white worms waiting for some fresh air. Not inside the pouch but in the outer carton. They explained it away by saying that it must have been stored next to some flour or similar products. Maybe but I still don't want to see worms when I open up the box, you know?! yeow! Shilpa, et tu?! I'll probably post a few times a week. For now, I am enjoying reading your blogs for a change! Confabulous, not true. And especially not so if you buy from ethnic grocery stores. If you stick to the McCormick, yes! Once in dire straits, I had to buy McCormick's coriander seeds. I got about quarter cup for $3. I bought about 8-10 times as much from the Indian store for the same price. Some spices are must-haves: mustard seeds, cumin seeds, asafetida, turmeric powder and red chilli powder as the absolute essentials. In the fresh herbs and spices, ginger and garlic are must-haves. Check out Bombay Bazaar in Aurora if you're in the area - despite the reviews! Yeah, and another big price difference is in semolina flour: buy it as a "specialty flour" and you can pay $6 a pound...buy it from the Indian grocery stacks and its 50 cents/pound. Uppama, halvah or noodles, its a big savings! Looks very nice and yummy. Bookmarked to try it. When I was a kid, my parents grew cauliflower in our garden. Every time we had it for dinner, I ended up getting a hideous, dead, steamed worm in mine. It's a wonder I'll still eat it! That said, your recipe sounds fabulous and I'm anxious to try it. Congratulations! I applaud all the bloggers who took part in NaBloPoMo. It is quite a feat. Cauliflower does not affect every nursing baby. The last time I tried to eat it, my daughter did get a little fussy. However, your post has reminded me that I should try it again! Just happened to see ur site.Its really wonderful work.Am new to blogging world. Please do visit my site at http://konkanworld.blogspot.com/ and give me ur suggestions and feedback. Indeed nice post, i jsut come on blog world after many short breaks in last souple of months, and find ther u bloggef the whole month ... needless to say that i missed many of your post, will take a look at all those soon . thanks for the great recipe, shall try it out. but my favourite remains just plain fried cauliflower. i dunno if anyone other than bongs make it that way. What a wonderful recipe and illustration. I love cauliflower without worms too. Look forward to browsing through your archives. made this today with anita's rajma. awesome. Manisha, I made this other day, and instead of tomato paste I used vindaloo paste. Spicy good! I'd like to post a picture of my version, with your recipe, giving you credit and linking to your site, of course. Is that allright with you? I want to be a good food friend. Sorry for being such a slacker and not keeping up with all your comments. It's the time of the year and I am super busy on all fronts! Bee, I can't believe you cooked cauliflower! Treehugger, please do post your version! I am always thrilled when someone uses my recipes, improvises and comes up with something that is unique and flavorful and more importantly, it is something they like! Yay for you! Thank you, Manisha. I love cauliflower. I have been following your copyrite thread, and am super cautious about giving credit. Let me know what you know about vindaloo paste, when you have time. Stay warm! Recipes cannot be copyrighted. The method - the manner in which it is described - and the other content around the recipe is protected by copyright. So you're fine! I do it all the time - I link to the original recipe or state clearly where the original recipe is from and then put my spin on it. There are times when I have permission from the source to use the recipe as is. Are you using Patak's vindaloo paste? I tried Patak's over a decade ago and unfortunately, I was not enthused much. However, I had a bachelor friend who found it easier to cook using those pastes rather than from scratch. I can't remember the ingredient list but I'd suggest you look for the usual red flags: too much sodium, HFCS, preservatives, etc. There was a time when I used bottled curries that I found at Trader Joe's. The quality wasn't consistent but they were a godsend in the days when I was working in an office and my daughter, then a toddler, was perpetually sick with ear infections, fever, coughs and colds. I agree Indian Food Rocks! Congrats on your blog. How come I just found you? Thanks to Google reader suggested reading. Hope you are having fun in India. It is on my to do list. AnJ, chopped tomatoes will take longer to cook down and you would need to add them much earlier than towards the end. Tomato purée might work better but in both cases don't add water. This subzi does not have much sauce; the paste just allows for a coating on the veggies. I wish I could tell you how many tomatoes or purée to add - it depends on how big and juicy your tomatoes are, so you might have to wing it.